How this practice can affect pump efficiency, NPSHr, axial vibration and more. 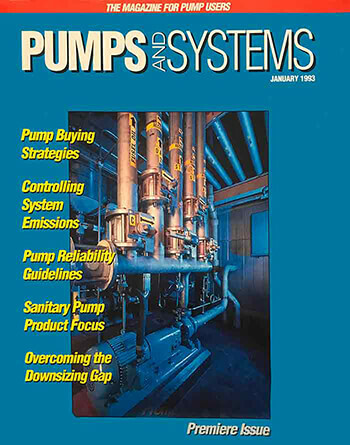 The cover of the first ever issue of Pumps & Systems, published in January 1993. Editor’s Note: The following article first appeared in the January 1993 issue of Pumps & Systems magazine. When trimming a pump impeller to change the flow and head, I sometimes get too much of a reduction. What is the problem? With a constant rotational speed, as is the case with most pumps, the “Affinity Laws” commonly used for calculating the trim do not accurately reflect the relationship between the change in impeller diameter and the hydraulic performance achieved by the pump. The calculations generally dictate more of a cut than required to affect the desired head and flow reduction. If the calculated trimming calls for a 10 percent reduction in diameter, only a 7 or 8 percent reduction should be made. The lower the specific speed of the impeller design and the larger the discrepancy. This subject is covered in only a few pump handbooks. The subject is well covered on pages 18 and 19 of Centrifugal Pumps – Design and Application, First Edition, by Val Labanoff and Robert R. Ross. The “Affinity Laws” assume that the impeller shrouds are parallel. In actuality, the shrouds are parallel only in lower specific speed pumps. 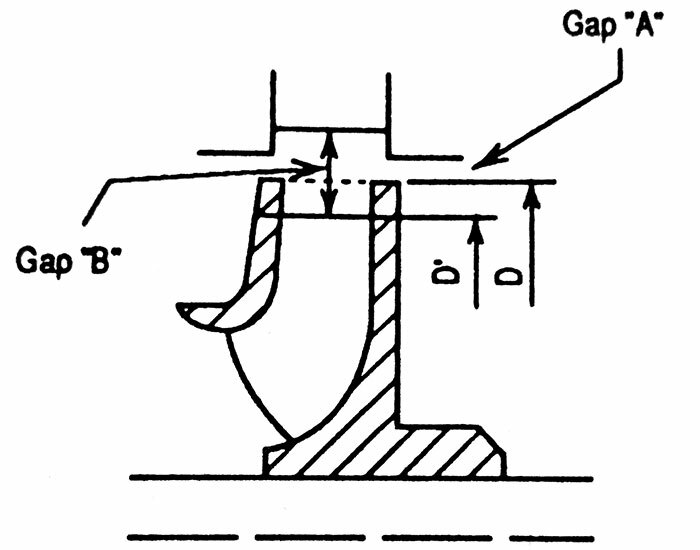 The liquid exit angle is altered as the impeller is trimmed, so the head curve steepens slightly. There is increased turbulent flow at the vane-tips as the impeller is trimmed, if the shroud-to-casing clearance is not maintained. All of these effects contribute to a reduced head development and flow. Pumps of mixed flow design are affected more than the true radial flow impellers found in higher head pumps. More caution has to be exercised in altering the diameter of a mixed flow impeller. What is the effect of trimming an impeller on pump efficiency? It depends on the specific speed of the impeller. The specific speed index classifies the hydraulic features of pump impellers according to their type and proportions. Most refinery pumps fall between about 900 and 2,500 on this index. Some vertical multistage pumps are in the 4,000 to 6,000 range. For radial designs, impeller diameter should not be reduced more than 70 percent of the maximum diameter design. Reductions in pump impeller diameters also alter outlet channel width, blade exit angle and blade length and may significantly reduce the efficiency. The greater the impeller diameter reduction from maximum diameter and the higher the specific speed (not suction specific speed), the more the pump efficiency will decrease with the trimming of the impeller. What is the effect of impeller trimming on net positive suction head required (NPSHr)? Small reductions in impeller diameter will increase NPSH only slightly. Diameter reductions greater than about 5 to 10 percent will increase NPSHr, which occurs because specific vane loading is raised by the reduced vane length, affecting velocity distribution at the impeller inlet. Not all pump companies consistently show on their pump curves the increase NPSHr with reduced impeller diameters. Attention must be paid to this factor when the margin between NPSHr and NPSH available (NPSHa) is very narrow or the NPSHr for a pump is extremely low. What effect does trimming an impeller have on axial vibration? 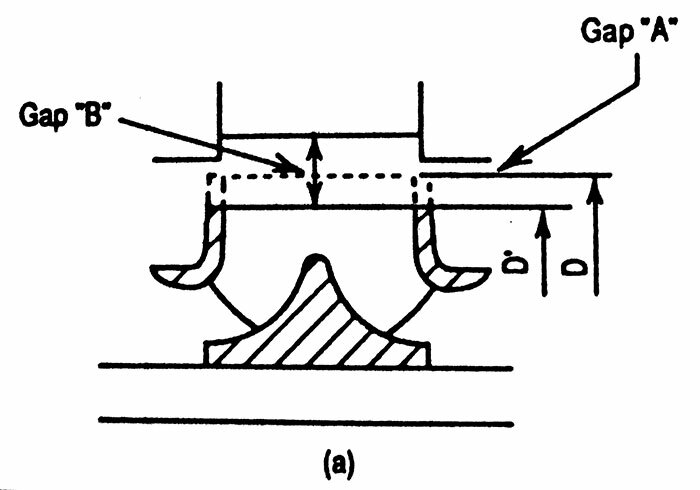 Excessive impeller shroud-to-casing clearances and suction recirculation cause eddy flows around the impeller, which in turn cause low frequency axial vibrations. Flow disturbances related to suction recirculation and cavitation are always present in both diffuser and volute type pumps. As the impeller diameters are reduced, the flow distribution pattern across the exit width of the impeller becomes more unstable. The tendency for the high-pressure liquid to return to the low pressure side and create tip recirculation is greatly increased. Again, the higher energy level pumps are of major concern—above 200 horsepower (hp) and 650 feet of head per stage.